Campfire Paper Table by Turnstone (TSPAPERTABLE) at Pure Design / Tables and Desks / Workspace ::: Furniture for the Home, Office, Home Office, and More at Pure Design Online! 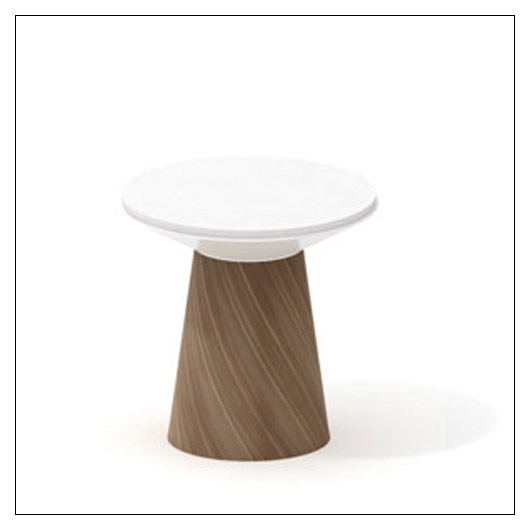 Product Description: Wood grain base with round rotating top allows easy sharing of ideas. Steel top can be used by itself or with paper or glass that can be drawn on with dry erase maker and used over and over again. Features and Benefits: Think of this as a campfire without the smoke. In a simple, functional, "why didn't we think of this before" kind of way, the paper table is just what you've been waiting for. Doodle and brainstorm, spin around to build off each other's ideas, then rip off the top piece of paper and take it with you. Easy. Care Instructions: Dust regularly with a soft, clean cloth. Occasionally, it may be necessary to use a mild non-abrasive cleaner. abrasive or solvent cleaner. When using any cleaning product, read and follow the manufacturer's directions carefully. Do not use abrasive or solvent cleaner. Wood, pressurized laminate, plastic, and steel. Comes with one set of 44 paper sheets. This product is MADE TO ORDER and therefore CANNOT BE RETURNED. Please allow roughly two weeks for your order to ship. This item can only be shipped to street addresses in the contiguous 48 United States.